The Nashville Predators are a professional ice hockey team based in Nashville, Tennessee. They are members of the Central Division of the Western Conference of the National Hockey League (NHL). The Predators' television broadcasting rights are held by Fox Sports Tennessee, whereas radio broadcasting rights are held by WPRT-FM. The Predators have played their home games at Bridgestone Arena since 1998. The club was founded in 1998 when the NHL granted an expansion franchise to Craig Leipold. After five seasons, the Predators qualified for their first Stanley Cup playoffs during the 2003–04 season. In 2008, ownership of the club was transferred from Leipold to a locally based ownership group. The Predators advanced to their first Stanley Cup Finals in 2017, but were defeated by the Pittsburgh Penguins in six games. In the following season, the Predators won their first Presidents' Trophy and Central Division title. The Predators are presently affiliated with one minor league team, the Milwaukee Admirals of the American Hockey League. In late 1995, rumors began to circulate that the New Jersey Devils would be relocating to the planned Nashville Arena. Nashville offered a $20 million relocation bonus to any team that would relocate, and the Devils attempted to terminate their lease with the NJSEA before ultimately restructuring it to stay in New Jersey. In August 1997, Barry Trotz was named as the first head coach of the Nashville Predators. After the attempt to get the Devils, NHL Commissioner Gary Bettman stated Nashville would probably be considered in upcoming expansion. The arena was opened in 1996, and after an attempt to bring the National Basketball Association's Sacramento Kings did not materialize, the city instead went after a hockey team. In January 1997, a group led by Wisconsin businessman Craig Leipold made a formal presentation before the NHL requesting an expansion franchise. When Bettman and league officials visited Nashville to tour the arena, thousands gathered on the arena plaza to greet them. In June, the league granted conditional franchises to Nashville, Columbus, Ohio, Atlanta and Minneapolis–Saint Paul. The Nashville team would be scheduled to begin play in 1998 if they met the NHL requirement of selling 12,000 season tickets before March 31, 1998. Of the four cities, Nashville was the only one with a completed arena and therefore began play first. One month later, Leipold named former Washington Capitals general manager David Poile as the franchise's first general manager. 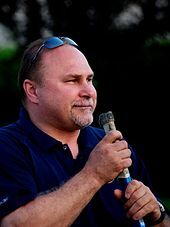 Portland Pirates' head coach Barry Trotz was named the franchise's first head coach on August 6. On September 25, 1997, Leipold and team president Jack Diller held a press conference where they unveiled the franchise's new logo, a saber-toothed cat (Smilodon floridanus). The logo was a reference to a partial Smilodon skeleton found beneath downtown Nashville in 1971 during construction of the First American National Bank building, now the UBS Tower. Once the logo was unveiled, the franchise held a vote among fans to choose a name. Three candidates were culled from 75: "Ice Tigers," "Fury" and "Attack." Leipold added his own submission to the vote, "Predators." On November 13, Leipold revealed at a press conference that his submission had won out and that the new franchise would be known as the "Nashville Predators." When awarded a franchise, the city of Nashville paid 31.50% of the $80 million fee to join the league. The city has engaged an affiliate of the team to operate the arena, and that agreement protects the city against annual arena operating losses over approximately $3.8 million. The $15 million payroll of the team was the lowest of the NHL. The Predators began play during the 1998–99 season, taking to the ice for the first time on October 10, 1998, where they lost 1–0 at home to the Florida Panthers. It was the only sold out game of the Predators' first five bouts in Nashville. Three nights later, on October 13, they defeated the Carolina Hurricanes 3–2 for their first win. Forward Andrew Brunette scored the first goal. The Predators, in their first year of existence, finished second-to-last in the Western Conference with a 28–47–7 record. In the 1999–2000 season, the Predators finished with a similar record to the previous season, and finished last in the Western Conference behind the Calgary Flames. However, during a game versus the New York Islanders on February 20, 2000, the Predators scored four goals in 3 minutes and 38 seconds. To begin the 2000–01 season, the Predators played two games in Japan against the Pittsburgh Penguins. Each team won a game in front of the largest crowds ever to see a hockey game in Japan. Backed by the goaltending duo of Mike Dunham and Tomas Vokoun, Nashville finished the season in tenth place in the Western Conference, ten points out of a playoff spot with a total of 80 total points. During the 2001–02 season, the Predators recorded their 100th victory on December 6, 2001. With that win, Nashville became the second-fastest expansion team of the 1990s to reach the 100-win plateau. In the 2002–03 season, head coach Barry Trotz broke the record for most games coached by the original coach of an expansion team (392 games). The club had failed to qualify for the Stanley Cup playoffs for their first five years as a franchise. However, in the 2003–04 season, the Predators finished eighth in the Western Conference, qualifying for their first post-season berth. 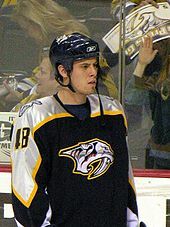 The Predators were eliminated by the Detroit Red Wings in six games in the first round of the 2004 Stanley Cup playoffs. The following 2004–05 season was wiped out by a labor dispute between NHL owners and players. Chris Mason became the ninth goaltender to score a goal in the NHL during the 2005–06 season. In the 2005–06 season, the Predators set an NHL record by winning their first four games by one goal each (although two of those were shootout victories, which would have been tie games in previous seasons). They also became only the fourth NHL franchise to start the season 8–0; the last time a team did so was the Toronto Maple Leafs, who set the mark with a 10–0 start in the 1993–94 season. The Predators set the franchise mark for wins in a season with a 2–0 shutout of the Phoenix Coyotes on March 16, 2006. In that match, Chris Mason became the ninth goaltender to score a goal. By the end of the season, the Predators had accumulated 106 points—their first 100-point season—and clinched home ice advantage in the first round of the playoffs for the first time in team history. They finished the season with an NHL-best 32–8–1 record at home. However, the Predators would be eliminated by the San Jose Sharks in five games in the first round of the 2006 playoffs. During the off-season, the Predators acquired veteran center Jason Arnott from free agency on July 2, 2006. In the following season, Arnott and David Legwand led the team in goals with 27 each. Late in the season, the Predators traded two former first round draft picks, Scottie Upshall and Ryan Parent, plus their first and third-round pick in the 2007 NHL Entry Draft, to the Philadelphia Flyers for five-time NHL All-Star Peter Forsberg. The Predators finished the season ranked fourth in the Western Conference with a franchise record 110 points, finishing third overall behind the Buffalo Sabres and the Red Wings. They were defeated by the Sharks in the first round of the 2007 playoffs for the second year in a row, losing the series 4–1. The roster saw a depletion in talent during the off-season. With multiple potential buyers, and rumors of the franchise moving hounding the team until almost mid-season, the Predators were not expected to be successful during the 2007–08 season. Chris Mason, former backup goaltender to Tomas Vokoun (who was traded to the Florida Panthers) had a shaky season and shared net-minding duties with Dan Ellis. Ellis, who was signed from the Dallas Stars before the season began, had a 233:39 long shutout streak (fifth longest in league history) nearing the end of the season that helped Nashville attain the eighth playoff spot with 91 points. The Predators met the Presidents' Trophy-winning (and eventual Stanley Cup winners) Red Wings in the first round of the playoffs and were defeated 4–2, their fourth-straight first-round knockout. The first off-season of settling in under new ownership was a quiet one for the Predators with little personnel movement. As such, the Predators began the 2008–09 season with little expectation. Following a strong push after the All-Star break and no movement at the trade deadline, the team found themselves still battling for a playoff spot into the last week of the season. Buoyed by the return of Steve Sullivan after almost two seasons recovering from a back injury, the Predators finished with 88 points, settling for tenth place in the Western Conference, missing the playoffs for the first time in five seasons. 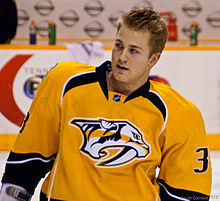 The 2009–10 season saw the debut of Colin Wilson with the Predators. The Predators made few major additions to their roster in the 2009 off-season, signing former San Jose Sharks forward Marcel Goc (who was extended for another year by the club in mid-season) and former Montreal Canadiens defenseman Francis Bouillon. The 2009–10 season also saw the much-anticipated debut of top prospect Colin Wilson. However, due to a groin injury suffered in training camp, Wilson spent the first week-and-a-half of the season on the sidelines, and was sent to the Milwaukee Admirals of the American Hockey League (AHL) in November. He returned to the club in February and scored 11 points in his next 15 games and finished the season with 15 points in 35 games. 2010 also saw a breakout year for the last pick in the 2005 Draft, Patric Hornqvist, as the 23-year-old Swede scored 30 in the 2009–10 season, becoming the fourth Predator to do so (the others being Steve Sullivan, Paul Kariya and Jason Arnott). The Predators qualified for the 2010 playoffs, facing the Chicago Blackhawks in the first round. The Predators earned their first postseason road win on April 16, 2010 when they beat the Blackhawks 4–1 at the United Center, although they lost the overall series in six games. On July 9, 2010, the Predators announced that defenseman Shea Weber would become the club's fifth captain. In the following years' playoffs, the Predators advanced to the second round of the playoffs for the first time in franchise history. They defeated the Anaheim Ducks in the first round, winning the fourth game of the series at Bridgestone Arena on April 24, 2011. 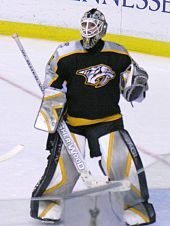 Two days prior, Predators' goaltender Pekka Rinne was nominated as a Vezina Trophy finalist for his performance during the 2010–11 season. The Predators played against the number-one ranked team in the NHL in the second round, the Vancouver Canucks. The Predators lost the series 4–2. On June 22, 2011, the Predators unveiled their modified logo set for the 2011–12 season. With the color scheme simplified to blue, gold and white and eliminating orange, silver and steel, the Predators cleaned up their primary logo and wordmark. A new alternate logo incorporating elements from a guitar pick and the Tennessee state flag was also introduced. In the beginning of the 2011–12 season, on November 3, 2011, the Predators signed goaltender Pekka Rinne to a seven-year, $49 million deal. It was the largest contract awarded in Predators' history, as well as making Rinne the highest paid goaltender in the NHL that year. On February 27, 2012, during the NHL's trade deadline, the Predators acquired Andrei Kostitsyn and Paul Gaustad from the Montreal Canadiens and the Buffalo Sabres, respectively. The Predators surrendered draft picks to bolster their team for the 2012 playoffs. The season also saw the return of Russian forward Alexander Radulov to the Predators after a four-year hiatus to play in the Kontinental Hockey League (KHL). For the second year in a row, and the second time in the team's history, the Predators won a first-round series in the Stanley Cup playoffs, defeating the Red Wings in a best-of-seven series 4–1. However, for the second year in a row, the Predators were ousted in the Western Conference second round, this time to the Phoenix Coyotes. The Predators signed Shea Weber to a 14-year contract in 2013, after the Philadelphia Flyers made a front-loaded offer sheet for Weber. The following 2012–13 season as a result of the 2012–13 NHL lockout. The Predators failed to qualify for the playoffs in the shortened season, the first time they failed to do so since the 2008-09 season. 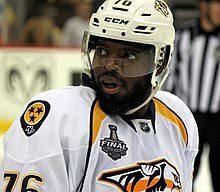 After the season, the Predators signed Weber through a front-loaded $110 million, 14-year offer sheet, $68 million of it as a signing bonus, from the Philadelphia Flyers on July 19. The offer sheet was the richest in NHL history in terms of total money, money per season, and length, surpassing the previous offer sheet record set by Thomas Vanek. The following season saw the departure of center David Legwand, the first player ever drafted by the Predators, the club's all-time leading scorer, and was co-leading scorer for the season at the time. Agreeing to waive his "no-trade clause", he was traded on March 5, 2014, to his hometown team, the Detroit Red Wings, in exchange for prospect forward Calle Jarnkrok, forward Patrick Eaves and a third-round pick in the upcoming 2014 NHL Entry Draft. After missing the playoffs for a second season in a row, the Predators opted not to renew the contract of Barry Trotz as its head coach after 15 years, although he was offered an unnamed position within the organization. On May 6, 2014, the Predators announced Peter Laviolette as their new head coach. In Peter Laviolette's first season as the Predators' head coach, the Predators finished second in the Central Division. Despite having home advantage in the first round of the 2015 playoffs, they lost the first round in six games to the Chicago Blackhawks, who went on to win the Stanley Cup. For the following 2015–16 season, the Predators finished as the Western Conference's first wild-card, earning 96 points. When they advanced to the second-round after beating the Anaheim Ducks in Game 7, it was the franchise's first seven-game series and seven-game series win. They were eliminated in seven games by the San Jose Sharks, who went on to win the conference. P. K. Subban during the 2017 Stanley Cup Finals. The Predators traded Shea Weber to the Montreal Canadiens for Subban in 2016. In the 2016 off-season, on June 29, 2016, the Predators traded Weber to the Montreal Canadiens in exchange for defenseman P. K. Subban. The trade surprised many hockey fans because the details to this trade were kept strictly confidential until the deal was already made. On September 7, 2016, the Predators announced Mike Fisher would replace Weber as the sixth captain of the club. In the 2016–17 season, the Predators finished fourth in the Central Division with 94 points, which earned them the second wild card spot in the Western Conference. The 2016–17 season marked the first time the Predators sold out all 41 regular season home games. Their eighth-place finish in the conference gave them a first-round Stanley Cup playoff matchup against the Chicago Blackhawks, who finished first in the conference during the regular season. The Predators swept the Blackhawks in four games. This was the first time that an eighth seed swept a playoff series against the top seed in the conference in NHL history as well as the first time that there had been a sweep by an eighth seed against a top seed in a best-of-seven playoff series in the history of North American major league professional sports. In the second round of the Stanley Cup playoffs, the Predators defeated the St. Louis Blues in six games, marking the first time the team advanced to the Western Conference Finals. On May 16, the Predators became the first team in 20 years (since the Detroit Red Wings in 1997) to achieve ten-straight wins at home in the postseason. On May 22, 2017 the Predators defeated the Anaheim Ducks 6–3 and won the series four games to two, winning the Western Conference, and advancing to the club's first Stanley Cup Finals. In the 2017 Stanley Cup Finals, the Predators went down 2–0 against the Penguins before battling back and leveling the series at two, winning games 3 and 4 at home. Returning to Pittsburgh, the Predators lost 6–0 before being eliminated at home 2–0 in game 6. On April 5, 2018, the Predators clinched their first division title in team history while also claiming their first Presidents' Trophy. They defeated the Colorado Avalanche in the first round of the playoffs in six games, and then lost to the Winnipeg Jets in seven games in the second round. The Predators have played their home games at Bridgestone Arena since 1998. The Nashville Predators have played their home games at Bridgestone Arena since their inaugural season in 1998. Opened in 1996, Bridgestone Arena is a multi-purpose venue in downtown Nashville. The Predators' practice facility is located at Centennial Sportsplex, a multi-use athletic complex located next to Centennial Park. Both facilities are owned by the Metropolitan Government of Nashville and Davidson County. Fans of the Nashville Predators have modified the octopus-throwing tradition of Detroit Red Wings fans to show their support: on occasion, a fan will throw a catfish onto the ice. The Tennessean newspaper of Nashville cites the first instance of this as being on October 30, 2003. On May 16, 2017, during Game 3 of the Western Conference Final at Bridgestone Arena, country music singer, songwriter, and record producer Keith Urban, who had performed the National Anthem prior to the game, was seen on the Jumbotron hoisting a massive catfish that Tennessee Titans left tackle, Taylor Lewan had with him at the game. Lewan, along with fellow Titans offensive linemen Jack Conklin, Quinton Spain, Ben Jones, and Josh Klein, and Titans quarterback Marcus Mariota, served as the hype men prior to the game, another Predators playoff tradition prior to home games, which included them waving gold Predators towels, Mariota encouraging the crowd to get louder, Lewan hoisting the catfish, and the offensive linemen chugging beer. Section 303 is where a section of fans at the Bridgestone Arena sit, stand, and cheer, colloquially known as The Cellblock. The group refers to themselves as "the loudest section of the loudest arena in the NHL." The fan-based organization has been recognized by the Predators' front office. A large banner was produced by the front office for posting on the wall behind the section. On April 3, 2008, with the Predators clinging to a 3–2 lead with 4:30 in their final home game of the regular season, a sellout crowd at what was then known as the Sommet Center, gave the team a standing ovation through the entirety of the final TV timeout. The Predators went on to win the game against the St. Louis Blues and advanced to the playoffs that year, where the "standing O" during the final TV timeout has since become a fan tradition. The mascot of the Predators is Gnash, a blue saber-toothed cat. Introduced in 1998, Gnash's trademark includes stunts, such as very fast rappels, zip lines, and a pendulum swing that takes him under the scoreboard and just inches off the ice. To go along with the saber-toothed cat mascot, Predators fans proudly use their Fang Fingers during each power play of the game. There are foam saber-fang gloves that can be purchased, but most fans simply curl their index and middle fingers on each hand into fang shapes and brandish them in an up-and-down motion. Fang Fingers are done to the horror sounds from the Alfred Hitchcock movie, Psycho. Fans are also known for a variety of chants taunting players of the opposing team, particularly the goalie. For example, after each Predators goal, fans call the opposing goalie's name, accompanied by shouts of "It's all your fault" and other epithets. These cheers are sometimes said to originate from tradition at college football games, but some of these derive from traditions held by fans of pre-NHL hockey clubs Nashville Dixie Flyers, Nashville South Stars, Nashville Nighthawks, and Nashville Knights. Nashville's fanbase is said by many to be among the loudest in the National Hockey League, with sound levels reaching over 120 dB during the playoffs. This has contributed to the team also being called "Smashville". Nashville's third jersey logo (2001–2007); a more detailed, three-quarters front view of the team's saber-toothed cat logo. For the 2011–12 season, the Nashville Predators changed their jersey design and color scheme. The home jerseys are a bright gold with navy and white highlights, while the away jerseys are white with gold and navy highlights. Furthermore, the Predators changed their logo, making it purely white, gold and navy. The jerseys have a guitar pick on the shoulder with the Tennessee state tri-star inside it, lines reminiscent of guitar strings on the numbers, and piano keys along the neck line inside the jersey as a nod to Nashville's internationally-known music heritage. From the 2016–17 season gold helmets became a permanent part of the home uniform. In the 2017–18 season the Predators changed their uniform style to fit with the new Adidas template. While the gold home uniforms received minimal alterations, the away white uniforms featured more gold accents in the sleeves, shoulders and tail while navy was relegated to trim color. The franchise was initially owned by a group led by Craig Leipold. On May 23, 2007, Leipold was reported to have reached a tentative agreement to sell the team to Research in Motion chairman and co-CEO Jim Balsillie. At the time, Leipold indicated that the team would play the 2007–08 season in Nashville but that the future of the team after that was not clear. On June 23, information was leaked by several sources indicating that Leipold no longer wanted to sell the Predators to Balsillie. Subsequently, a campaign to land the team in Kansas City, Missouri, received a boost in late June 2007. The Canadian National Post, citing anonymous sources, reported that Leipold planned to sell the team to San Jose venture capitalist William "Boots" Del Biaggio III, who wanted to relocate the club to Kansas City's new Sprint Center for the 2008–09 season. Del Biaggio, who had a contract with Anschutz Entertainment Group to own an NHL club that would play home games in Sprint Center, had made an offer reported to be for about $190 million for the Predators. Del Biaggio had entered an agreement two years earlier, in 2005, to purchase the Pittsburgh Penguins, but the club backed out of the deal after it won the NHL draft lottery and took Sidney Crosby with the first overall pick. On July 19, 2007, a group of local business owners known as Our Team Nashville held a rally at the Sommet Center to encourage fans to buy season tickets in order to help the Predators meet the attendance figures needed to keep the team in Nashville. They drew approximately 7,500 fans and sold the equivalent of 726 full season tickets during the rally. The rally was heavily supported by George Plaster, then a sportscaster on WGFX 104.5 "The Zone" sports radio in Nashville. On August 1, 2007, the group released a letter of intent from Craig Leipold. After negotiations with the City of Nashville, the local group headed by David Freeman reached an agreement with Nashville Mayor Karl Dean, and the NHL Board of Governors approved the sale on November 29, 2007. The $172 million acquisition of the Nashville Predators included repayment of existing debt of approximately $61 million and $2.2 million in fees and expenses. The sale of the Predators to the Tennessee-based group included Del Biaggio, who had been trying to move the team to Kansas City. The locally based buyers held 73% of the team, while Del Biaggio and a minority partner acquired about 27% of the club. In June 2008, Del Biaggio ran into legal trouble over a multitude of unpaid loans, culminating in his filing for Chapter 11 bankruptcy. Furthermore, it was alleged that Del Biaggio acquired the loans he used to buy his stake in the team through fraudulent means, prompting an FBI investigation and criminal charges. The charges culminated in a 97-month prison sentence for Del Biaggio. Under United States bankruptcy law, a trustee was appointed to sell Del Biaggio's assets, including his stake in the Predators, to pay off his creditors. In November 2011, it was announced that Calgary businessman W. Brett Wilson had purchased a 5% interest in the Nashville Predators. On March 1, 2010, during the 2009–10 season, the Predator's front office saw Freeman stepped down as chairman of the Nashville Predators in favor of Thomas Cigarran. Cigarran announced on September 2 that the local ownership group had completed the purchase of the Del Biaggio stake. On June 23, 2016, Freeman filed a $250 million lawsuit against the Nashville Predators and Cigarran. His claim was that his ownership stake has been improperly diluted by Cigarran failing to notify him of capital calls, and that he had not received loan guaranty fees that the ownership group had agreed to pay him. The lawsuit stated that Freeman initially owned a 48% share, while the holding company for the Nashville Predators stated that Freeman controlled less than 1% of ownership in the team at the time of the suit. This dilution was exacerbated by the existence of two classes of investments in the Predators: the common units owned by Freeman were subject to capital calls; the Series A units originally owned by Del Biaggio and his minority partner were not subject to capital calls. The dispute was sent to court-ordered arbitration on July 29, 2016, under the supervision of NHL commissioner Gary Bettman. As of January 25, 2018, arbitration was continuing in the unresolved dispute. The outcome may remain undisclosed, as the arbitration is private. This is a partial list of the last five seasons completed by the Predators. For the full season-by-season history, see List of Nashville Predators seasons. Other than 99, retired league-wide to honor Wayne Gretzky in 2000, there are no retired Predators numbers. David Legwand is the franchise's all-time leader in points, goals, and assists. He was also the final member of the inaugural team to retire or move. These are the top-ten point-scorers, goal scorers, and assist leaders in franchise regular season history. Figures are updated after each completed NHL regular season. ^ "Predators Logos and Jerseys". NashvillePredators.com. NHL Enterprises, L.P. Retrieved May 31, 2018. ^ Willis, Thomas (June 20, 2017). "Photoblog: Predators New Adidas Uniforms for 2017-18". NashvillePredators.com. NHL Enterprises, L.P. Retrieved September 28, 2017. ^ "Miscellaneous Arena/Game Night Information" (PDF). Nashville Predators 2018–19 Media Guide. NHL Enterprises, L.P. September 24, 2018. Retrieved April 19, 2019. ^ "Nashville Predators Name Peter Laviolette Head Coach". NashvillePredators.com (Press release). NHL Enterprises, L.P. May 6, 2014. Retrieved May 31, 2018. ^ MacFarquhar, Neil (June 29, 1995). "HOCKEY; Fans Caught Between Devils and Nashville". The New York Times. Retrieved May 19, 2010. ^ Sandomir, Richard (June 8, 1995). "1995 N.H.L. PLAYOFFS; Devils Reject Offer on New Lease". The New York Times. Retrieved May 19, 2010. ^ Sandomir, Richard (July 14, 1995). "HOCKEY; Devils and New Jersey Call Truce and Strike Deal". The New York Times. Retrieved May 19, 2010. ^ "HOCKEY; Nashville Still Seeks Team". The New York Times. July 14, 1995. Retrieved May 19, 2010. ^ a b c Farber, Michael (November 9, 1998). "Hockey-Tonk Town Nashville and its biggest country music stars have taken a down-home hankerin' to the expansion Predators". Sports Illustrated. Retrieved May 28, 2017. ^ Litsky, Frank (January 14, 1997). "Cities Line Up To Join The N.H.L". The New York Times. ^ "N.H.L. Names 4 Cities For Its New Franchises". The New York Times. June 18, 1997. Retrieved May 19, 2010. ^ "NHL Expansion Franchise Nashville Chooses Poile For GM".Boston Globe. July 10, 1997. ^ a b c "Nashville Predators Timeline". Nashville, TN: WSMV. Archived from the original on January 8, 2009. Retrieved May 28, 2017. ^ Ingram, Tom (October 2, 1971). "Specialists to Study Cave Bones". Nashville Tennessean. p. 7. ^ Guilday, John E. (July 1977). "Sabertooth Cat, Smilodon Floridanus (Leidy), and Associated Fauna From a Tennessee Cave (40DV40), the First American Bank Site". Journal of the Tennessee Academy of Science. 52 (3): 84–94. ^ Jones, Donald W. (April 15, 2008). "Metropolitan Nashville Council, Analysis Report for April 15, 2008" (PDF). nashville.gov. Metropolitan Government of Nashville and Davidson County, Tennessee. Archived from the original (PDF) on May 28, 2010. ^ Pekka Rinne named a finalist for Vezina Trophy, ontheforecheck.com, April 22, 2011. ^ "Preds Unveil New Logos". NHL Enterprises, L.P. June 22, 2011. Retrieved May 31, 2018. ^ "Predators Eliminate Redwings". The New York Times. April 21, 2012. Retrieved April 21, 2012. ^ "Nashville Predators trade David Legwand to Detroit Red Wings". The Tennessean. Retrieved February 25, 2018. ^ Curtis, Cory (April 21, 2017). "Predators sweep Blackhawks with 4-1 win". wkrn.com. ^ "Ducks Resting Up for Aggressive Preds Down 2-1 in West". The New York Times. Associated Press. May 17, 2017. ^ "Colton Sissons' hat trick pushes the Predators into their first Stanley Cup finals appearance". ESPN. May 22, 2017. Retrieved May 22, 2017. ^ Vingan, Adam (April 5, 2018). "Predators win Presidents' Trophy, Central Division, Western Conference in resilient victory against Capitals". The Tennessean. Retrieved April 6, 2018. ^ Apel, Kara (May 17, 2017). "Keith Urban, Titans Offensive Line Hype Up Preds Fans a Playoff Game" (published May 31, 2017). Archived from the original on March 13, 2018. Retrieved March 13, 2018. ^ Bonvissuto, Dominic. "Section 303: I came, I saw - I yawned". Nashville City Paper. Archived from the original on September 27, 2007. ^ "An Introduction To Smashville". National Hockey League. Nashville Predators. April 27, 2010. ^ Godfrey, Steven (April 17, 2015). "How the Nashville Predators built a fan base in the heart of college football country". SBNation.com. Vox Media, Inc.
^ "Nashville Knights hockey team statistics and history at hockeydb.com". hockeydb.com. ^ "Preds' postseason run has turned Music City into Smashville". Fox Sports. Associated Press. May 11, 2017. ^ Bratten, Brooks (September 15, 2016). "Preds Adopt Gold Helmets for Every Home Game". National Hockey League. Retrieved November 6, 2016. ^ "Canadian Billionaire To Buy Predators". newschannel5.com. Nashville, TN: WorldNow. May 24, 2007. Archived from the original on October 16, 2007. ^ Cox, Damien (June 23, 2007). "NHL calling the tune in Nashville". Toronto Star. Toronto, ON: Toronto Star Newspapers Ltd. Retrieved May 28, 2017. ^ Wilson, Kevin (July 20, 2007). "Local supporters stage successful ticket rally". National Hockey League. Archived from the original on August 7, 2007. ^ "Predators set to sell team to local group". ESPN. Associated Press. August 2, 2007. Retrieved May 28, 2017. ^ Maki, Allan (June 13, 2008). "Del Biaggio's trials take another twist". The Globe and Mail. Retrieved May 29, 2017. ^ "Nashville reaches deal to consolidate ownership". The Globe and Mail. July 21, 2010. Retrieved May 29, 2017. ^ "St. Denis takes rare path to NHL". The Gazette. Montreal. November 17, 2011. Archived from the original on November 23, 2011. ^ Hoag, Dirk (March 1, 2010). "David Freeman steps down as chairman of the Nashville Predators". On the Forecheck. Vox Media, Inc. Retrieved May 28, 2017. ^ Hoag, Dirk (September 2, 2010). "Nashville Predators complete purchase of Boots Del Biaggio shares". On the Forecheck. Vox Media, Inc. Retrieved May 28, 2017. ^ Rau, Nate (June 23, 2016). "Predators owner sues team, chairman for $250M". The Tennessean. Retrieved May 7, 2017. ^ Steimer, Jacob (July 29, 2016). "Predators lawsuit sent back to arbitration, major win for team". Nashville Business Journal. American City Business Journals. Retrieved May 7, 2017. ^ "IN RE BIAGGIO | Case No. 08-30991 TEC, Adv. Proc. No. 12-3065 TEC". Leagle.com. November 8, 2012. Retrieved May 7, 2017. ^ Barchenger, Stacey; Rau, Nate (July 29, 2016). "Judge rules in favor of Predators, Cigarran, arbitration". The Tennessean. Retrieved May 7, 2017. ^ Cavendish, Steve (January 25, 2018). "Email Allegations in Preds Ownership Fight". Nashville Scene. Retrieved February 2, 2018. ^ Rau, Nate (April 25, 2018). "Nashville Predators to name Herb Fritch new chairman, replacing Tom Cigarran". The Tennessean. Retrieved May 23, 2018. ^ "Nashville Predators Roster". NHL.com. Retrieved December 14, 2018. ^ "Nashville Predators Hockey Transactions". TSN.ca. Retrieved December 14, 2018. Wikimedia Commons has media related to Nashville Predators.